“Celebration Days,” Vaughn Displays, Inc.
You didn’t need to be a professional to construct a parade float. 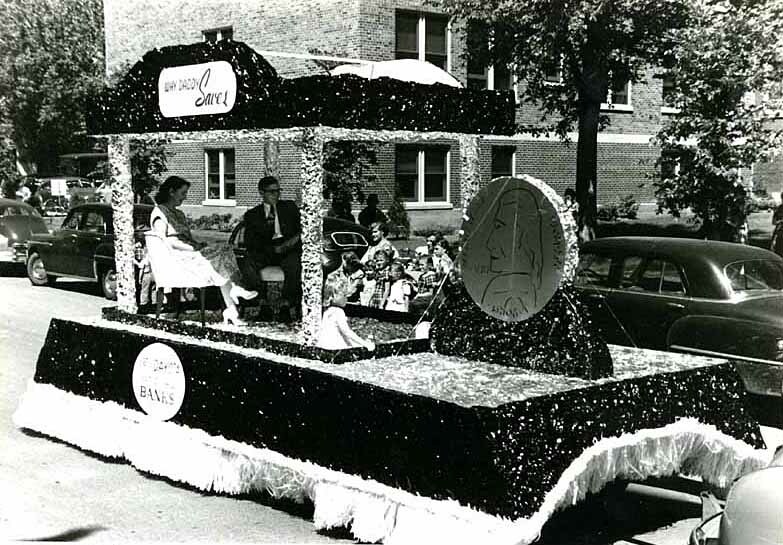 A number of manufacturers offered kits, allowing anyone—in the largest city or the smallest town, display pro or amateur—to build a float. Catalogs presented a wide variety of blueprints and suggestions, floral sheeting (coverings made to look like blankets of flowers), and miles of garlands and fringe. 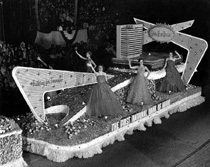 Parade float file, Vaughn Displays, Inc. 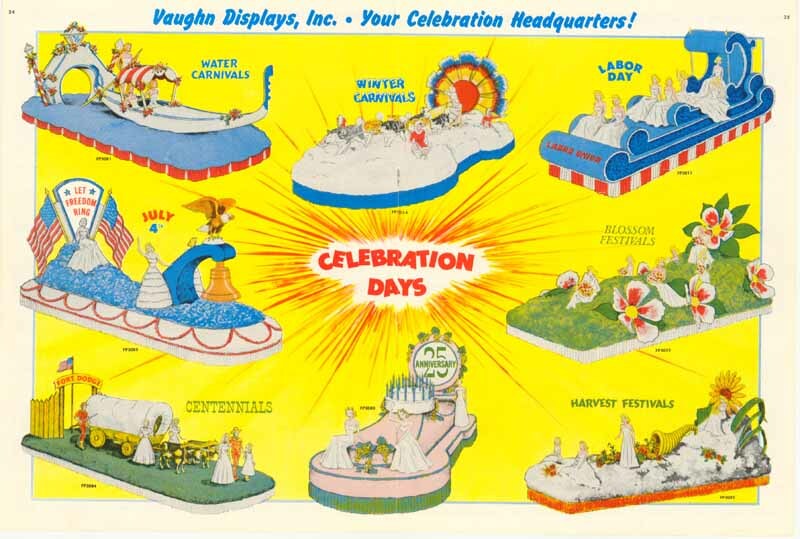 In the mid-1950s, Vaughn Displays Company, Inc., became the world’s largest manufacturer of parade float kits. 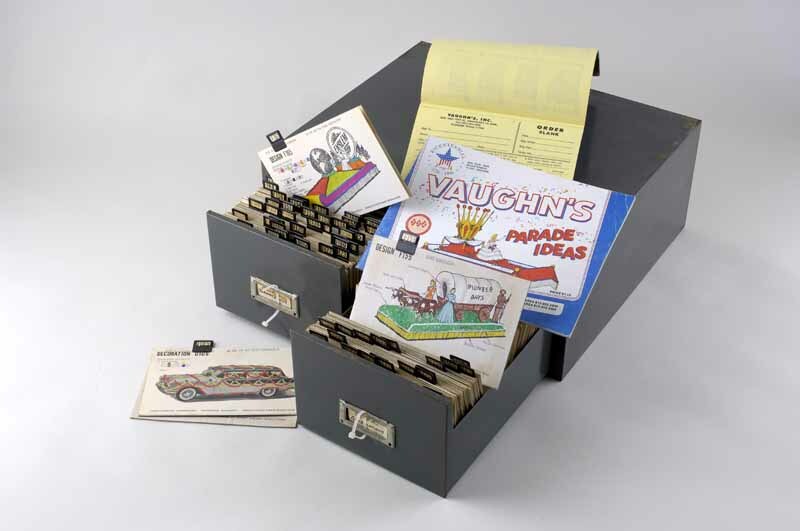 The creator of the kits was Cyrus A. Krake, Leroy Vaughn’s long-time collaborator, designer, and inventor. Vaughn’s kits were rooted in their experience as float designers for the Minneapolis Aquatennial, and for a regional parade circuit that included Miami’s King Orange Festival (Orange Bowl), Tampa’s Gasparilla, and Havana, Cuba’s Carnival. While the floats for these parades were elaborate, custom-made creations, Vaughn’s kits let anyone try their hand at float construction. An index of designs for all holiday occasions, the float file was used to fill orders received from catalog customers. One of Vaughn Displays’ most prolific customers, North Dakota float builder Herman Smith, favored scenes of home and family life. On this float, advertising a bank, a family rests under a canopy representing a well-appointed living room, with their hero, a savings-bank depositor.